Snake River weaves it way through the Western landscape in Wyoming, from Yellowstone down to Grand Teton National Park and into Jackson Hole and beyond. Learn more about this river and why it should be on every Jackson Hole traveler’s list for its awesome water-based activities. Here at Goosewing Ranch, we love the landscape in our neck of the woods, and one of the natural beauties is the Snake River. 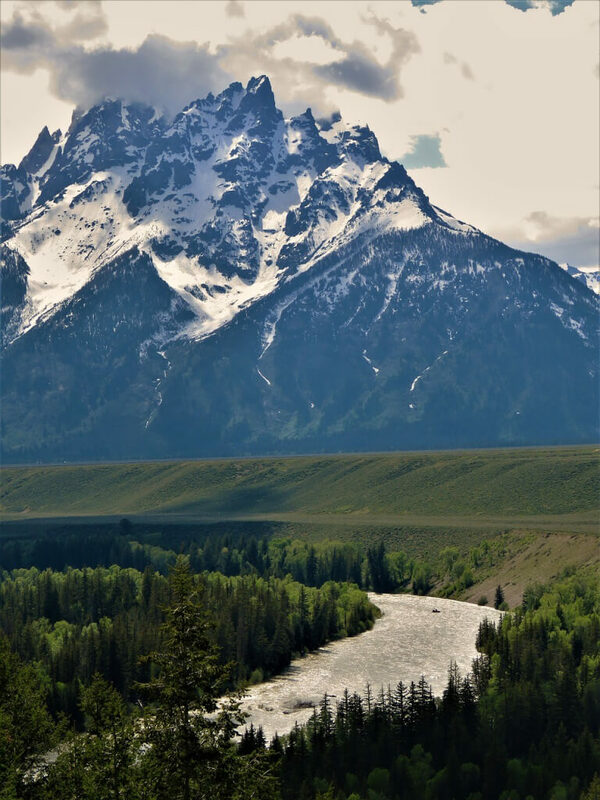 This rollicking river wows with Teton views, terrific rapids, and stunning scenery. The Snake River is the 9th longest river in the US at 1,078 miles and the longest tributary of the Columbia River. Its drainage basin covers parts of six states which are Idaho, Nevada, Wyoming, Oregon, Utah and Washington. The average flow of the river is 1,553 cubic meters per second. The Snake River likely got its name from European explorers who misinterpreted the sign made by the Shoshone people. The Shoshone made swimming motions which appeared to these explorers to be a snake. In actuality, they were signing that they lived near the river with many fish. Lewis and Clark were the first American explorers to discover it. Between 1804 and 1806, Lewis and Clark sailed down the Snake River to the Columbia River. Lewis is credited as the first American to see this river’s drainage basin, so it is often called Lewis Fork. In Jackson Hole, there are many activities centered on Snake River. From rolling rapids to calm waters through Grand Teton National Park, rafting makes the cut on many guests’ wish lists. For outdoor fun and an adrenaline boost, whitewater rafting is the way to go. The most popular rafting section of the river stretches from Grand Teton National Park and travels through Jackson Hole. If relaxation and soaking in the scenery is more your speed, then we suggest a scenic float. Enjoy a secluded trip down Snake River inside the Grand Teton National Park for a one-of-a-kind way to see the national park. Be sure to bring a camera and binoculars to take in all the wildlife and great shots. Most whitewater companies also offer scenic float excursions. Ask the experts and they will agree that Snake River is perfectly suited for fly fishing whether a beginner or expert. Plus, there are those incomparable views of the Tetons. Many outfitters offer fly fishing in the area and welcome all ages (kids should be old enough to sit in a small drift boat for a half or full day). All fishing in Jackson Hole is catch and release to keep population levels high. We also have fishing here on our ranch to give it a try before taking on Snake River. If planning any of these activities, be sure to bring appropriate apparel. Check out our packing list of suggested items for a Western vacation.